It is one of those tiny little factors when optimizing your website: the meta description. Is it a ranking factor? Some disagree, but you can definitely say it is worth optimizing, after all, it is somewhat of an advertisement for your website. When people spot your site in the SERPS, your meta description is what makes them click on your link, right? In my basic seo training sessions I always explain that the meta description is at least useful for the searchers to distinguish what is on your page and why they should pick your page in stead of another. And that you should always explain to people what they can find on that specific page. However, when I ask them to write down in about 150 characters why their website should be ranked number one they mostly write down how important it is for their business. Not thinking like a searcher people! Getting your meta description in order is important for that final click. To persuade searchers to click your result in stead of the one above or below yours. But recently it has become more important and more difficult with it. A few changes by Google make that it now is REALLY time to take a look at your meta descriptions. Of every page. 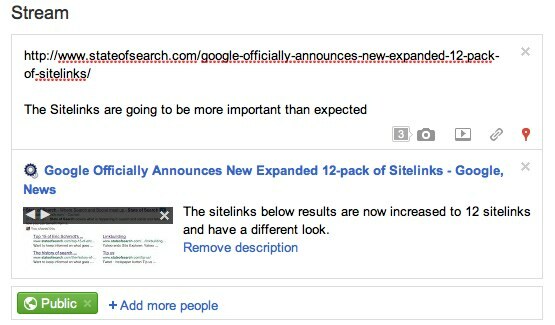 Last week Google officially announced that they were going to change the way they show sitelinks for a website. From the eight ‘boring’ links they changed it to twelve links. But those links got something extra: links and… meta descriptions! Noticed something? Easy to spot right? No, it is not the fact that my profile page isn’t there, or that some pages might not be relevant enough: I haven’t optimized all the sitelinks for every page yet. Its about the descriptions. The About page, the “tip us” page, the bloggers page and the specific pages for Nichola and Lisa all start with “Tweet · instapaper button“. That is from the sharebar-plugin code I use. If I would have optimized the meta descriptions it would look a lot nicer. There is however a difficulty here. Google has chosen to only show a very small portion of the meta description, so if you start the meta description with “Find information on what…” chances are people won’t “get” what is behind that sitelink. You have to be really to the point to get your message a cross. “Blogposts by Peter Young” for example would be much better in this case. Another interesting element is that Google tends to differentiate in the sitelinks. 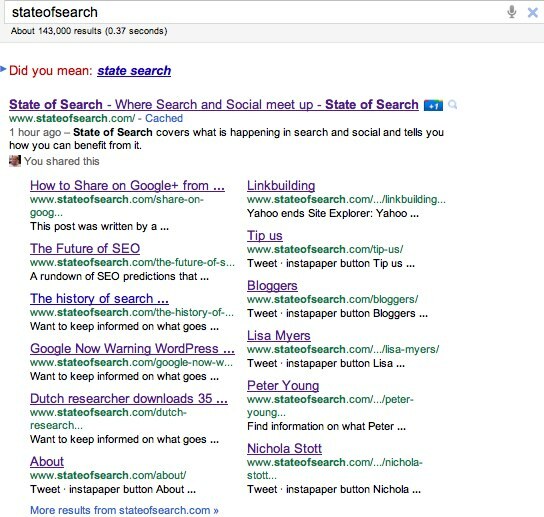 Before you could see which sitelinks Google had picked for you in your webmastertools. Now you can only exclude certain pages in your webmastertools. There is a reason for that. On different searches Google seems to give different sitelinks, and even a different number of sitelinks. Twelve for “stateofsearch” and only eight for “stateofdigital.com”! And on top of that, not all the same sitelinks. And other searches give back 12 different sitelinks. In some cases I even still get ‘only’ four small ‘old fashioned-styled’ sitelinks. Depending on the search, the sitelinks can differ. I want to make a bet that it could even differ per person, with personalized search in mind. What does this mean? You have to get your sitelinks in order FOR EVERY PAGE. Google really wants in on the social stuff. So they decided they would launch their own social network: Google Plus. And Google Plus is growing. In a rapid speed some say. So it is time to pay attention there. Why? Because Google Plus is a social network and on a social network people share. And what do people share…? Links! And they share many. Surprisingly enough Plus is already the second largest referral to State of Search, so it is probably time to start paying attention there. 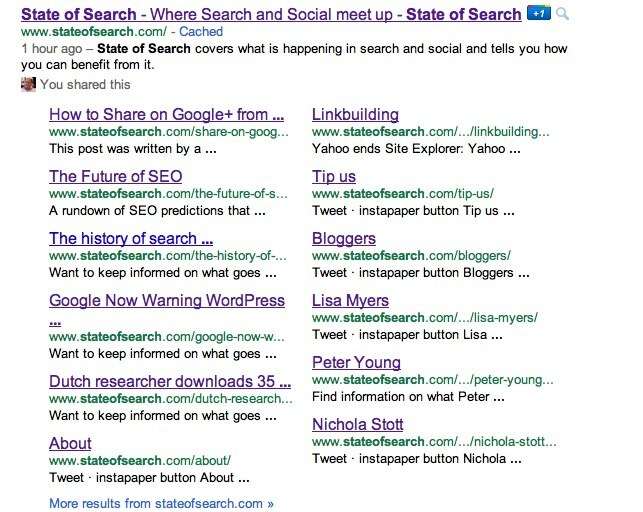 The ‘description’ just gives us the navigation: pages and all the names of the bloggers of State of Search. And this is the very same description which is used for the sitelinks and the meta description below a search result. In this case it is maybe very nice for the bloggers, but again, not very informative. Would you click on it? Maybe, but not very likely, and you would have to maybe think twice. And people don’t want to think twice. Now people who share your content on plus might click on the “remove description” link, but my guess is many won’t. And you should make it as easy as possible for your peers to share your content. A well optimized description is much more likely to be clicked on. This, by the way, is not just important for Google Plus. Facebook also takes the meta description when you share a link there. As you see I have some work to do. My guess is that many of you do too. But where to start? Below are a few pointers. If you feel like it, add some more pointers in the comments. For me “think from a searchers perspective” is the most important one. To make things easier on yourself try to make sure you have the option to put in a meta description in your CMS on every page. For WordPress I use Yoast’s WordPress SEO plugin, which makes it very easy for both me and the bloggers to put in the description. But there are probably more options for that out there. 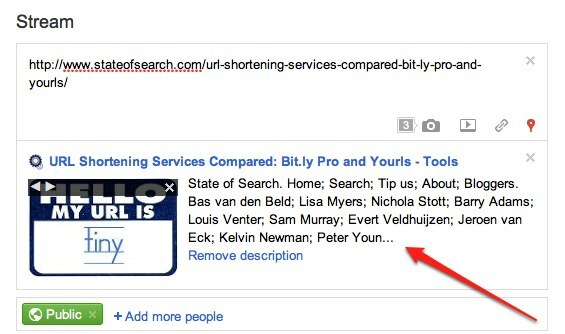 UPDATE: Joost de Valk kindly pointed out that the number of characters which now have become the most important are the first 35 characters which will show up underneath the new sitelinks. Make sure you stay within those first 35 so the last word doesn’t drop off. Thank you Joost for pointing that out ;). Can’t agree more with importance of meta descriptions Bas – even if they’re not a ranking factor, working in a keyword will embolden on a click through and the short copy is basically an advertisement for the content of the page. Also, it normally gives something nice that you can pull in for your Open Graph description too, which is ideal for sharing and you can customize it. So..this means that we have to optimize all of our meta descriptions all over again to ensure that this short blurb is readable? Additionally, we’ll also have to exclude our Privacy Policies, Contact Us and other such pages from Webmaster Tools as well to prevent that sitelink space from being wasted. Love this post, I love it whenyou take something that everyone says…that doesn’t matter…and then flip it on them…Great ideas guys. I love spam comments. I love it when you say something so generic that it can apply to almost anything, but not quite everything…and then you post it in one of the few places it does not apply…great spam man! Even bigger this week now that Google has turned the Plus to anyone and no longer requires an invitation. Time to get the meta descriptions in order – at least on the top pages.